What Does My Record List Do? List, search and share your vinyl records, cd's, cassettes and more - See Examples Here! Enter your email, choose a username and GO! 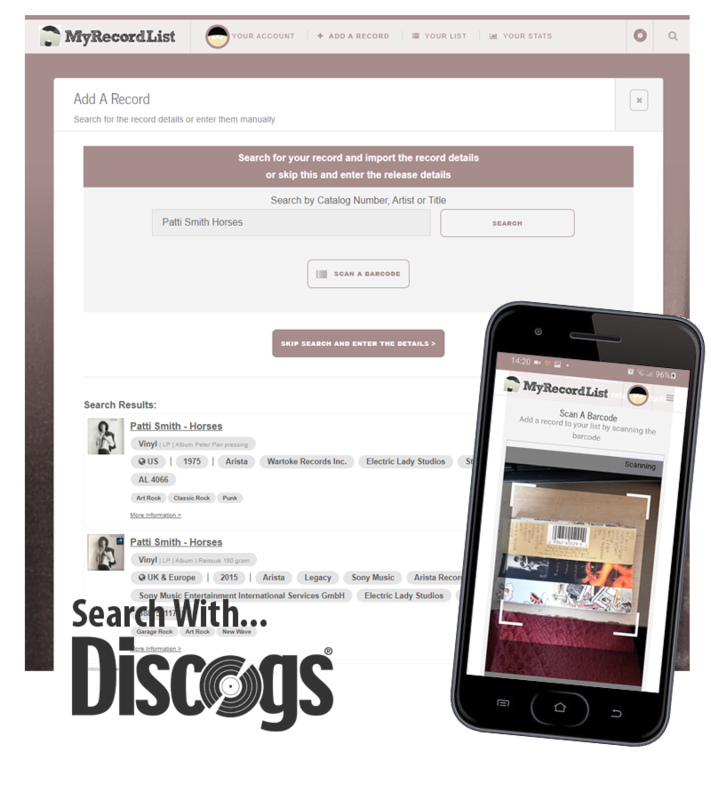 Simply enter the record details or grab the release information from discogs.com extensive database. Upload your own or grab the images of the sleeve, discs and other inserts with our simple search. Already a Record Nerd or have a Discogs List? No problem - you can import CSV lists (other lists on request). Most records have an embedded player from Spotify allowing you or your friends listen and discover the hidden gems. 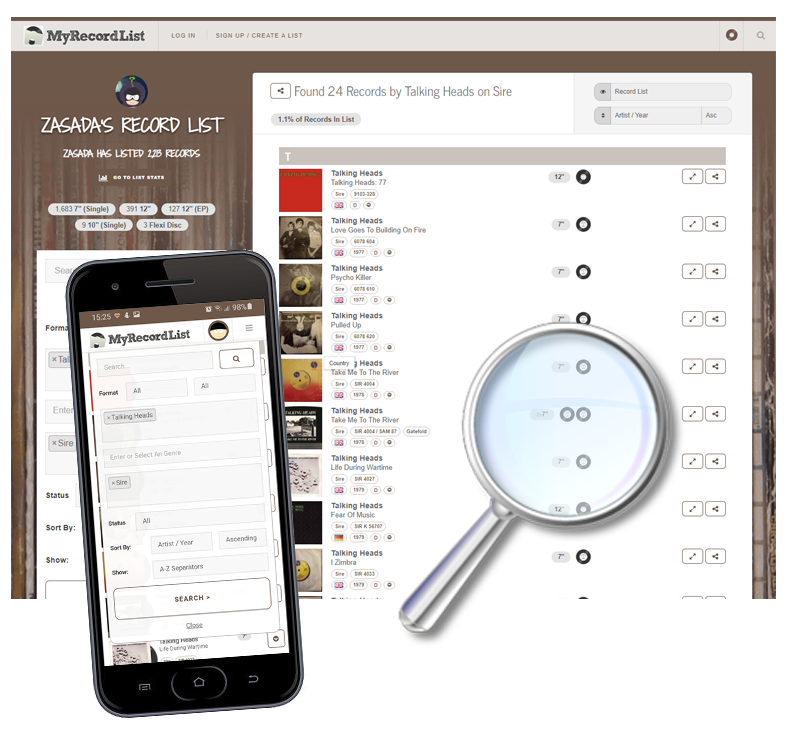 MyRecordList works well on most Smartphones and Tablets (and also has a pretty home screen icon) - check your collection while in the shop or on-the-go. Not just a list...a collection! It is not just about vinyl, you can also list CDs, Cassettes, DVD's and more. Enter multiple artists and labels for a record and maintain filtering and 'searchability'. Enter details about the condition, the sleeve and the number of discs with simple controls. Use the color pickers to select the disc color, enter the matrix details and optional description. Select if the record is a Test Press, Promo Copy or Reissue and include any details if it is limited or numbered. ...and if that is not enough, there is more! Searching and advanced filtering makes your collection easy to manage. Display your collection in Grid mode, List Mode (with images) or Text List mode (without images). Why wait until you get home or dig through piles of vinyl to check what you already have? Search by Artist, Title, Label and more in seconds. Select an Artist, Label, Status, Format or a combination from the dropdowns to quickly filter your collection. Each record has its own page and overview including image gallery and direct links to other related releases you own. Click to share the records you are #NowPlaying on your social media profiles. Thumbnail images of the disc colors makes checking for colored discs easy. View and share your stats showing your top Artists, Releases, Labels, Years, Formats and Genres in your collection.